Pre-heat your oven to 180°C/Gas Mark 4, and bring a pan of water to the boil. Mix the smoked paprika, thyme, lemon juice, 2tsp of the olive oil and grated garlic, and brush all over the pork. In a large frying pan add the last of the olive oil and cook the pork until sealed all over then place onto an oven tray and cook for about 25 minutes. Now the pork’s cooking, add the potatoes to the boiling water for 5 minutes, cook and drain. In a large bowl mix the tomato puree, garlic and paprika with a splash of water to make a paste. Toss the potatoes, cherry tomatoes and pepper in the paste, season with salt and milled pepper then tip onto a roasting tray, drizzle over the olive oil and cook for about 15 minutes. Stir in the spinach, pop back into the oven for a further 5 minutes then serve with the sliced pork and some wilted chard or any vegetable of your choice. 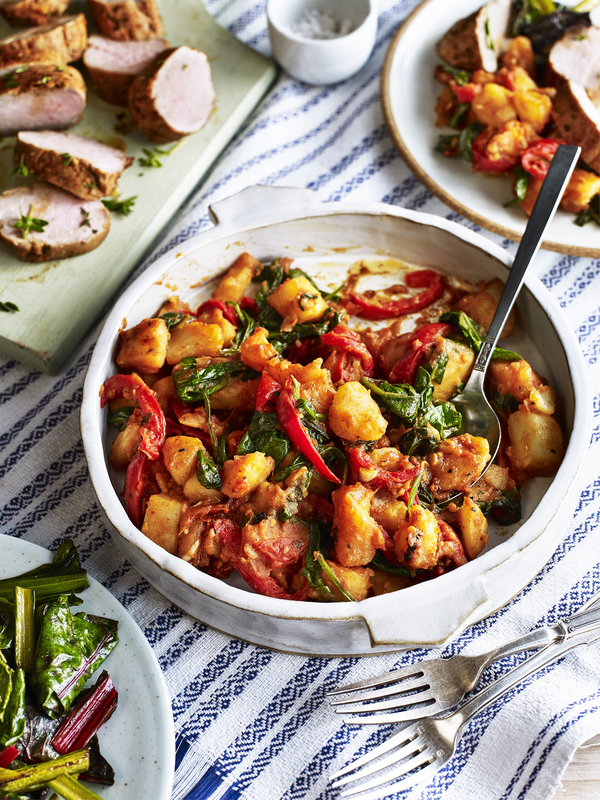 Slice the pork and serve with the potatoes and some wilted chard for a great meal. Check out the video for this recipe below and feast your eyes on a wealth or potato recipe videos on our video hub.